American has made a modest improvement to their Same-Day Flight Change policy and added the benefit of being able to make same-day flight changes online. The fees remain unchanged. 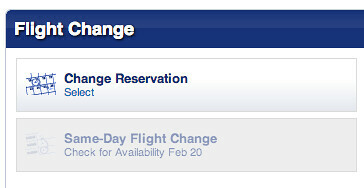 Beginning 24 hours prior to departure, you can request a same-day flight change on aa.com through the check-in window. Just select each passenger who is requesting a flight change and pay the $75* per passenger charge. There were some reports in the forums that American was waiving the $75 fee for some AAdvantage elites, sources at AA later confirmed that the policy remains the same: AAdvantage elite customers can travel for free on standby, or make a same-day confirmed change for $75. 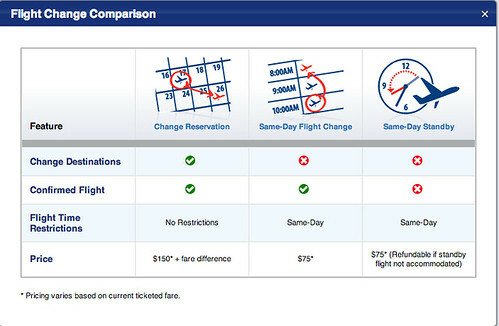 Here’s a new graphic that briefly explains Same-Day Flight Change options. Here’s the new option that appears under your reservation. I did a standby yesterday at DCA to JFK. I am gold. It was free. @ Mark – Standby is (and always was) free for elites, it’s the confirmed same-day change that’s $75. That’s what was rumored to have been waived. I did the same day change for $75 last weekend at DCA (at the kiosk). I love the convenience of this! Following UA! Now I feel compelled to switch airlines! @ Ryan – I was lucky and got my salad. My colleague ordered the shrimp and grits and enjoyed them. He even put a small spoonful of the grits on my plate so that I could give them a try…..next time I’m ordering the shrimp. 🙂 Thanks for sharing your review! Best use of same day CFC for me so far, switched a cheap EWR-LAX (with upgrade request still pending) flight to a more expensive JFK-LAX flight (but with R inventory), get around the post-Hurrican Sandy mess that were the NJTransit and PATH trains, and instantly clear an upgrade to boot! Worth the 75$!